The Daily Mail uses a small sample experiment to "prove" videogames alters behavior. We should be above such flame-baiting, but it's difficult to ignore headlines like "Violent videogames DO make people more aggressive" in today's edition of the Daily Mail. The article cites a study from the Indiana University School of Medicine which will be published in full at the meeting of the Radiological Society of North America next week. The study compared MRI scans on 11 men from 18 to 29 years of age playing "violent" games ten hours a day for two weeks and those who didn't. The study reported that there was a difference in the brain activity of the group that played games, and the Daily Mail jumped on those results with inflammatory language and the obligatory photo of a kid playing GTA: San Andreas. "Violent videogames can alter the brain in just one week and make players more aggressive," read the Daily Mail article. The study, it must be noted, never mentions aggressive behavior. "A study has found that key areas in the brain suffer reduced activity, and leave it physically altered. The findings will fuel the debate over the impact that violent games have on regular players and links to anti-social behavior." The full research paper hasn't been released to the public, but the abstract currently available on the Radiological Society of North America website (RSNA.org) provides some conclusions. "After one week of violent game play, the videogame group showed less activation in the left inferior frontal lobe during ES task and less activation in anterior cingulate cortex during the CS task, in comparison to the control group and also related to their own baseline scan. Moreover, the videogame group gained more prefrontal activation after the second week without game play," writes lead researcher Yang Wang, MD. The experiment doesn't seem like it was meant to vilify games, only to test how the brain works when playing videogames. The only thing that bugs me about the language in the abstract is the researchers specifically refer to the games the subjects played as "violent" without stating which game was played or why that title was more violent than others. To me, the experiment only proves that gamers just use their brains differently. The altered brain activity does not necessarily translate into violent or aggressive behavior, and the jump to hammer home that link by the Daily Mail is what pisses me off. Terms like "anti-social behavior" and "aggressive" were never used by the study abstract and only fans the flames of the anti-gaming crowd. Come on, Daily Mail, I know you are just a tabloid, but you can do better than that. Also, please update your stock photography. 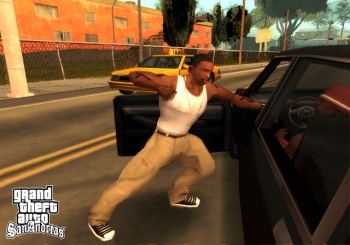 Grand Theft Auto: San Andreas is 7 years old already.